HE’S set to dance with Dame Maggie Smith. Sing again – briefly – in a poignant scene. And facing more drama tonight (Sunday) when General Sir Herbert Strutt arrives to inspect the convalescent home. 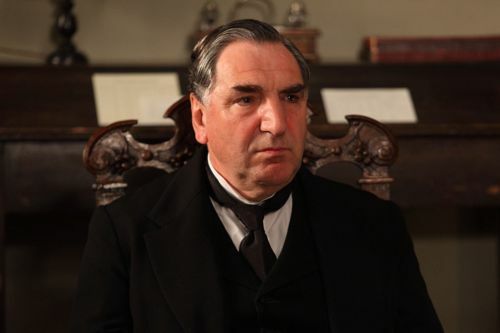 But Downton Abbey star Jim Carter, who plays butler Mr Carson, currently has other things on his mind. Having flown out to Ghana on Friday for a charity challenge. I spoke to Jim before he left – with my story on Pg 5 of today’s Sunday Express. Below is a fuller version of our chat, with some mild Downton Abbey spoilers. 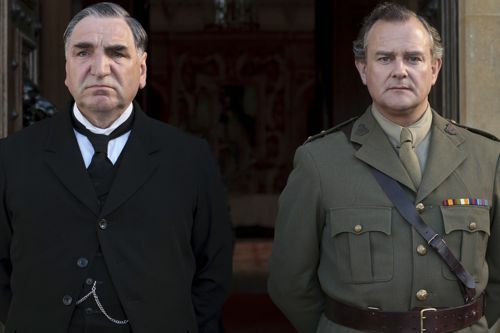 AS Downton Abbey’s loyal butler Mr Carson, he has faced the challenge of running the nation’s favourite household in the darkest days of The Great War. Believing that the way to defeat The Hun is to keep domestic order, even when his footmen are being called away to fight in the trenches. 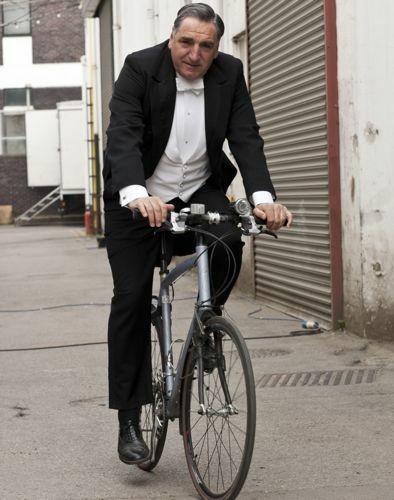 Now actor Jim Carter, who plays Lord Grantham’s redoubtable servant, is about to take on his own personal trial – a charity cycle ride across Ghana. “I think Mr Carson would find it rather undignified. It’s alright for a footman but not for a butler,” said Carter, 63. Emmy award-winning Dowton’s nine million ITV1 viewers saw the overworked butler collapse in the dining room in last Sunday’s second episode of the new series. Later tucked up in his bed, he had recovered enough to offer some fatherly advice to Lady Mary, played by Michelle Dockery, about matters of the heart. “I can reassure everyone that Mr Carson is fairly indestructible and is on the mend,” revealed Harrogate-born Carter, who flew out to Africa on Friday. Four days after his return from that Equatorial heat, Carter will be filming wintry scenes for Downton Abbey’s Christmas Special. With speculation that ITV1 will give it pride of place in their Christmas Night schedule to ensure a festive ratings win. The special follows the end of the current eight-part series and features the events of New Year’s Eve 1919 leading into 1920. A prelude to a third series, to be set in the Roaring Twenties. “I shall be covering myself in Factor 60 sun tan lotion in Ghana because I can’t turn up looking like Carson’s Mexican brother. So I shall be trying to keep the sun off the face at least. It includes the Annual Servants’ Ball, with Carson due to trip the light fantastic with the Dowager Countess of Grantham, played by Dame Maggie Smith. In the first series it was revealed that the butler had once been part of a song-and-dance stage act called The Cheerful Charlies. 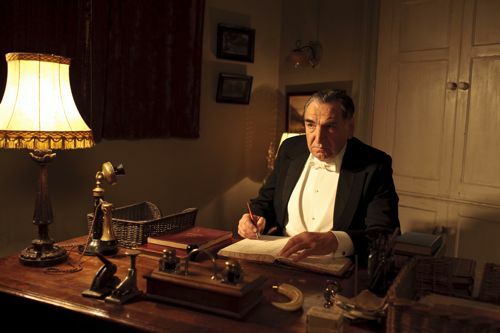 Viewers will see Carson briefly sing again in episode four(Oct 9) of this second series when Downton stages a poignant concert for the wounded officers under their care. His charity bike ride training has included cycling from the north London home he shares with Harry Potter actress wife Imedla Staunton to Ealing Studios, where Downton’s downstairs scenes are filmed. The veteran actor, whose many other roles include retired military man Captain Brown in Cranford, brings Carson’s sense of order to the capital’s roads. “Thankfully I haven’t had any accidents. I’m confident, and being pretty large I tell the traffic where I’m going in no uncertain terms. He will cycle hundreds of miles in Ghana over six days to raise money for clean water in the impoverished rural town of Tafo, where the ride finishes. Carter is a friend of British TV comedy executive and producer Humphrey Barclay, who was made a chief of the village when he attended the funeral of actor Christopher Asante, who starred in the Channel 4 sitcom Desmond’s, which ended in 1994. This will be his tenth charity ride. The previous nine – Jordan, Costa Rica, Laos, Vietnam, India, Namibia, Chile and Argentina and London to Paris (twice) – were in aid of the National Deaf Children’s Society. “I came off once, in India, but in a very gentle way when my wheel got stuck in a rut and the bike tipped over. I’ve been cycling for 55 years, so I know how to look after myself reasonably well and I don’t take enormous risks. “Underneath my exterior I do have a level of determination to get there. You have to face the challenge and you have to complete it. I pedal every inch of the way,” added the actor, who will be part of a team of 25 riders. The Downton cast are fully behind Carter’s off screen adventure. His global audience of fans will be hoping Mr Carson returns to the big house safe and sound. “People have great affection for Carson. It’s very nice to see the amount of pleasure people are getting from the series. “Just today I bumped into a couple of my neighbours and they said, ‘We’re so glad to see it back on. Sunday nights are just marvellous now.’ I’m delighted. “It also means I give better value to charities now. Although I’ve done 40 films and 100 TV shows, I don’t court publicity so people might not have instantly recognised me. The veteran star has also become a favourite among the young ladies of Downton, both above and below stairs. “There’s nothing like a Carson cuddle,” confessed Sophie McShera, who plays kitchen maid Daisy. “That’s only because they’re frightened of me,” he joked. I also spoke to Jim at the Downton Abbey series two press launch at Highclere Castle earlier this year. “The First World War is a bloody disappointment to Carson. Having half his workforce taken off to war is extremely inconvenient. Having maids serving in the dining room is a nightmare, never mind what’s going on at the Front. He’s quite narrow in his perspectives. He thinks it’s very important to keep up standards. He spoke of how the phenomenal success of Downton Abbey proved that viewers still had an appetite for top drama. “It looks good and it looks expensive. And it might be that people are tired of cheap, rubbish reality TV. “It’s good quality work done properly. Given proper attention. That’s nice. Attention to detail, getting it right. “Downton is very cinematic. You see the colours and the size of the house and the landscape, it looks like cinema rather than narrow TV. “And when the dining table is out in here, it fills three quarters of the room and you’ve got 12 characters around it, all of whom speak. Phyllis Logan, who was sat next to Jim, added: “There seems to be a yearning. 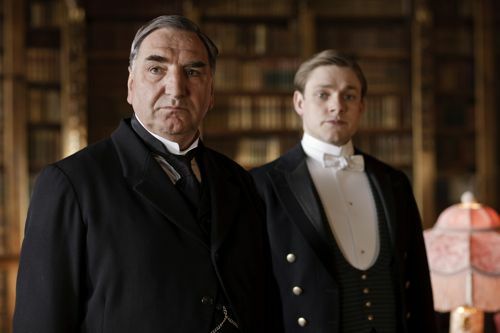 Posted in Downton Abbey, News and tagged Downton Abbey, Jim Carter, Mr Carson. Bookmark the permalink.